Baba Farid University of Health Sciences (BFUHS) Recruitment 2019: Baba Farid University of Health Sciences has recently publish an advertisement notification for Professor,Associate Professor,Assistant Professor Posts vacancies jobs opening for August 2019. The BFUHS notification for the Professor,Associate Professor,Assistant Professor Posts, candidates who are interested may apply in the prescribed application format on or before 29-08-2019. The total vacancies in Baba Farid University of Health Sciences (BFUHS) Professor,Associate Professor,Assistant Professor post details are given below. Starting Date to Apply Online Application Form: 09-08-2019. Last Date for Submission of Application: 29-08-2019. The minimum educational qualification for BFUHS Recruitment 2019 for the Professor, Associate Professor, Assistant Professor posts is given below. Candidates should possess Full-time Embased Medicas/ Associate Professor in the subject for three years in a recognised Post graduate Medical College in concerned specialty M.Sc. (Microbiology)……………(Please check full details in the advertisement). For Assistant Professor should Minimum 40 years. For Associate Professor should Minimum 45 years. For age relaxation please check advertisement. 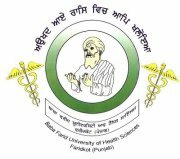 Helpline No : 01639 – 256234 and Baba Farid University of Health Sciences, Sadiq Road, Faridkot, Punjab-151 203,India.